Kevin Keener, an associate professor of food science, created a process for rapidly cooling eggs that is designed to inhibit the growth of bacteria such as salmonella. The same cooling process would saturate the inside of an egg with carbon dioxide and alter pH levels, which he has found are connected to the activity of an enzyme called lysozyme, which defends egg whites from bacteria. Freshly laid eggs are saturated with carbon dioxide and have pH levels of about 7. Over time, the pH level rises to 9 and carbon dioxide escapes, Keener said. As that happens, lysozyme becomes less active. Keener saturated purified egg white lysozymes with carbon dioxide and tested different pH levels. He found that at both high and low pH levels, the addition of carbon dioxide would increase lysozyme activity by as much as 50 percent. The cooling process Keener developed would create the same conditions, he said. The additional lysozyme activity would give eggs more time to self-eliminate harmful bacteria. 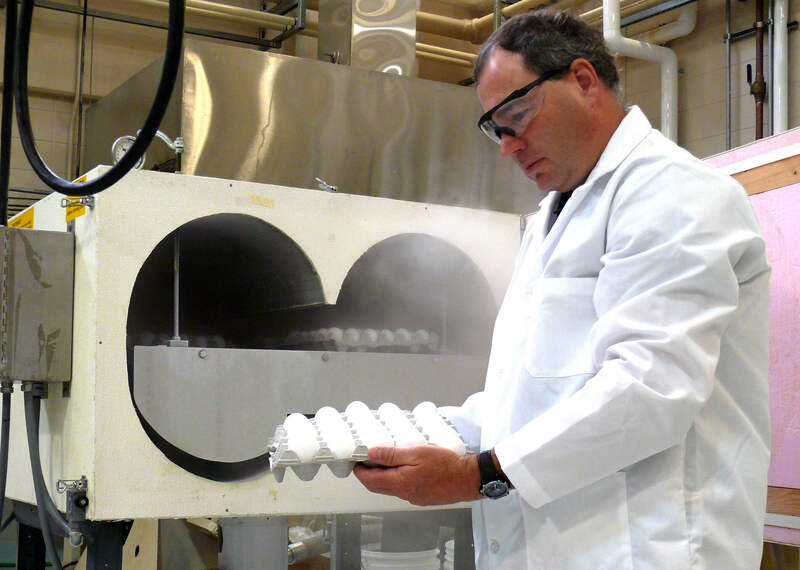 Keener’s cooling technology uses carbon dioxide “snow” to rapidly lower the eggs’ temperature. Eggs are placed in a cooling chamber and carbon dioxide gas at about minus 110 degrees Fahrenheit is generated. The cold gas is circulated around the eggs and forms a thin layer of ice inside the eggshell. After treatment, the ice layer melts and quickly lowers an egg’s internal temperature to below 45 degrees Fahrenheit. The eggshell does not crack during this process because it can resist expansion from a thin ice layer. Keener said Food and Drug Administration studies show that if eggs were cooled and stored at 45 degrees or less within 12 hours of laying, there would be an estimated 100,000 fewer salmonella illnesses from eggs in the United States each year. Keener will continue to study the molecular changes that occur with egg cooling. Rapid cooling of shell eggs by using liquid CO2 has shown increased bactericidal effects along with saturation of the egg albumen with CO2. Lysozyme is a bactericidal enzyme present in chicken eggs, and it lyses gram-positive bacteria. Newly laid chicken eggs have an initial pH of 7.6 to 8.5 and are saturated with CO2. During storage, the pH gradually increases to 9.7, accompanied by a loss of CO2. It is hypothesized that the lysozyme activity is influenced by either CO2 concentration or pH changes resulting from CO2 loss. The objective of this study was to determine the lytic activity of purified lysozyme and chicken egg white (unpurified lysozyme) under varying conditions of temperature, pH, and CO2 gas concentration. Lytic activity was determined by a standard microbial assay using lyophilized Micrococcus lysodeikticus. A 2 x 4 x 2 x 2 x 3 factorial design consisting of 2 temperatures (5 and 22�C), 4 pH (4.5, 6.5, 8.0, and 9.5), 2 treatments (with and without CO2), 2 types of lysozyme (purified and unpurified egg white), and 3 replicates was used. The highest lytic activity was found at pH 6.5 and 22�C. At pH 4.5 and 8.0, the addition of CO2 increased lytic activity by more than 50% at both temperatures. At pH 6.5, lytic activity was maintained with CO2 addition at both temperatures. At pH 9.5, lytic activity without CO2 addition was high; however, adding CO2 reduced lytic activity to zero. In conclusion, both pH and CO2 treatment influence lysozyme activity.